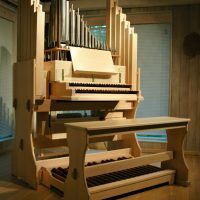 Bedient Pipe Organ Company is pleased to offer the Legacy Line of pre-designed instruments. 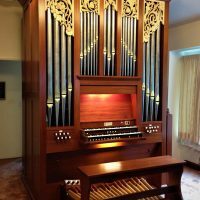 The Legacy Line was created in response to customers who were interested in smaller pipe organs of exceptional quality that could be built at an affordable price. These instruments have proven to be both elegant and reliable, with their music gracing churches, practice studios, and residences across the United States. The collection has evolved over the years, but in 2018, the Legacy Line received the most complete revision ever. Driven by a desire to offer instruments tailored to specific purposes, we closely examined each model. We thought about how each organ might be used and which features and stops would best suit that purpose. We optimized the designs for efficient construction, but allowed enough flexibility that they can still be adapted or customized when desired. We also created a few exciting new models to complete the collection. Although the instruments are displayed here in three categories, the individual instruments can easily serve in other roles too. All of the Legacy Line instruments feature the highest quality materials and workmanship available. Mechanical key and stop action offers the greatest musical sensitivity. Every rank of pipes is carefully constructed and voiced for each customer’s unique acoustic environment. Each instrument is built of select hardwoods, locally sourced whenever possible. Wood species, finishes, and other details are customized specifically for each customer. Take some time to browse through the exceptional pipe organs in our newly revised and expanded Legacy Line. 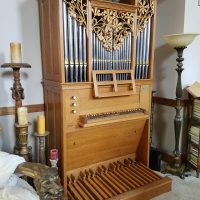 Imagine the elegant sounds from one of these instruments leading worship in your church or providing hours of enjoyable practice in your home or on campus. And if you don’t see exactly what you are looking for, the Legacy Line models can serve as a spring board for ideas, leading to a unique, custom designed pipe organ. We are always happy to discuss your needs and answer questions about our Legacy Line. Give us a call.